Mystery shopping protocol has come a long, long way thanks to technology. In the “old days” reports were hand written, printed, and mailed to the client; now, clients can receive reports within days of a shop being completed. On the quality control side, similar advancements have been made for the good of the industry. Two that will be highlighted include geotargeting and photo DNA. 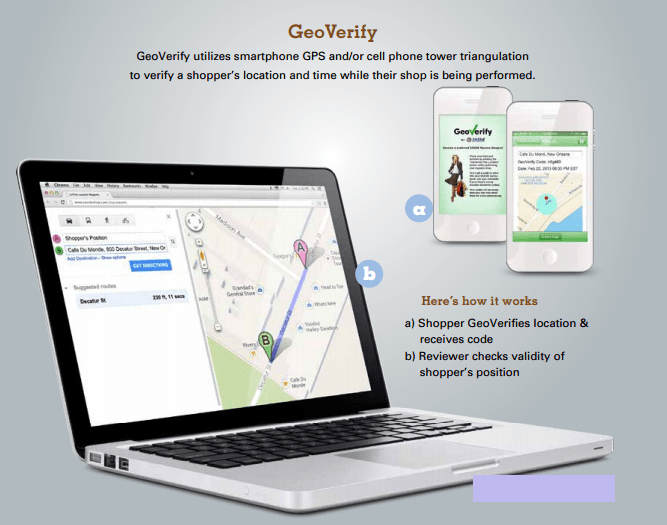 GeoVerify: this is an excellent tool for clients who have multiple locations within a small geography (such a gas stations or convenience stores), but can be used globally to ensure that mystery shoppers were at the appropriate location on the date and time they reported. Using cell towers and mobile phone technology, shoppers can “check in” to a location, very similar to using FourSquare, and confirm their location. In addition to receipt and business card verification, geotargeting gives an added layer of confirmation to ensure the correct location was evaluated and that the report date and time are consistent with the shopper’s whereabouts. 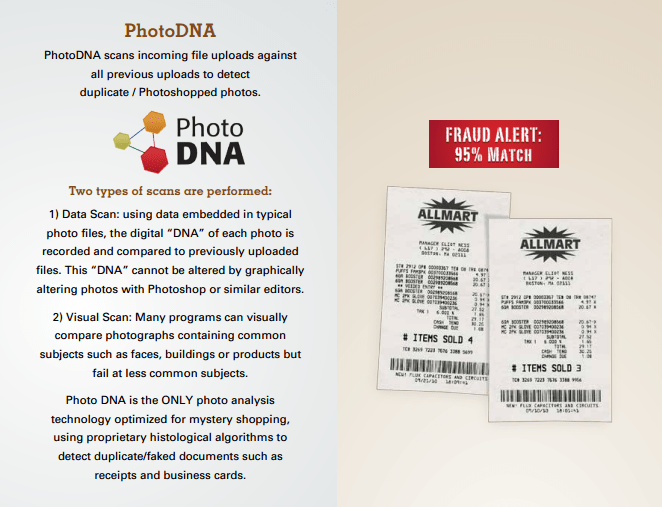 Photo DNA: most, if not all, shops are validated through the submission of receipts and business cards depending on the nature of the evaluation. To ensure that these documents are not photoshopped in the case of fradulent activity, or that the same business card is used for more than one shop, photo DNA is quite useful. Essentially, each document that is uploaded is “read” for its DNA. As new documents are uploaded across the system, they are scanned to see if there are any possible matches already in the system. Users are notified via email alerts when possible matches are found so that additional investigation can be conducted. The more tools mystery shopping providers have at their disposal, the better the quality control within the company. The goal of a provider is to ensure that all evaluations are accurate, detailed, and useful to the company; these are two of the tools utilized when processing reports. They give the clients and providers a peace of mind when conducting such programs.